In this review, we take a look at the BLACK+DECKER GLC3630L20-GB 36V Lithium-ion Strimmer. Founded in Baltimore in 1910, the Black & Decker Corporation has long manufactured a variety of impressive power tools and home improvement products. It is particularly known for producing cordless strimmers that are both innovative and highly efficient. It therefore, comes as no surprise that the BLACK+DECKER GLC3630L20-GB turned out so superbly. With its E-Drive Technology, this cordless strimmer boasts of a high torque gear system that results in fast cutting speeds of up to 8,500 revolutions per minute. Such high speeds ensure that your work gets done much faster no matter how heavy duty it is. Another feature we just love is the Power Select one that allows you to choose between two modes; Eco and Turbo. The Eco mode provides maximum run-times that make it especially suited for light tasks. On the other hand, the Turbo mode provides a highly-appreciated power boost that comes in handy when you are dealing with tough overgrowth. 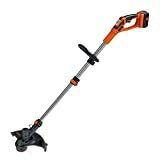 Due to its high versatility, the BLACK+DECKER GLC3630L20-GB is loved by many a dynamic gardener. Not only does this cordless strimmer trim grass but it can also be used as an edging tool. Moreover, the fact that it doesn’t come with a cord means that it eliminates the risk of you tripping over it and having an accident. This also ensures that you have more freedom of operation. With one battery being able to provide up to 3750 linear meters in one charge, you will be able to comfortably use this strimmer for a long time before you need to charge it. This is all due to long-lasting Lithium-ion battery technology. This technology also ensures that your battery takes a very short time to charge. Weighing in at a meager 3.5 kilograms, this cordless strimmer is pretty light. You will also love that it comes with a rubberized non-slip telescopic handle that is comfortable enough to use for long periods of time. If this isn’t enough, it also comes with an adjustable secondary handle. This dual handle system increases both maneuverability and balance. However, the most outstanding feature of the BLACK+DECKER GLC3630L20-GB is its innovative Auto Feed System which automatically feeds out the line from the spool. This system is way more convenient than the traditional bump feed system that requires you to bump your strimmer’s head on the ground when you need more line from the spool. Ultimately, the Auto Feed System saves you both time and money. The fact that this cordless strimmer comes with a 2-year guarantee is yet another reason we love it. This battery doesn’t self-discharge and can hold a charge for up to 18 months while idle. Additionally, since it has no chemical memory, it can be charged even when it’s not completely flat. Another thing we love about this battery is its ability to work at very low temperatures. This makes it possible for you to use it all year round. This charger enables you to charge your battery quickly and efficiently. It takes around one hour to completely charge your Lithium-ion battery using this charger. This accessory was designed to be a replacement part for the BLACK+DECKER GLC3630L20-GB. The spool is pre-wound with a 10-meter line of 1.5 mm in diameter. It is important to note that this accessory is compatible with several other BLACK+DECKER strimmers. If there is one discovery that we have made about this cordless strimmer, it is that it comes with a host of benefits. Here are some of them. Even the best of cordless strimmers have their faults. The BLACK+DECKER GLC3630L20-GB is no exception. Here are a couple of things to look out for. It comes as no surprise that the internet is swarming with positive reviews of the BLACK+DECKER 36 V Lithium-Ion Strimmer. This cordless strimmer is full of innovative features that allow it to accomplish tasks that other strimmers could only dream of. It also boasts of superior cutting speeds, a lightweight, and a long battery runtime. Ultimately, this BLACK+DECKER cordless strimmer offers an impressive blend of high power, efficiency, and appealing aesthetics. Although it is quite expensive, the BLACK+DECKER GLC3630L20-GB is worth every penny. If its high selling rate is any indication, gardeners and lawn owners everywhere find this cordless strimmer worth it too.